Situated in the centre of the North Island, Mt Ruapehu with its summit at almost 3000 metres attracts some of the country's heaviest snowfalls. Located on the volcanic plateau in central North Island, Mt Ruapehu is half way between Auckland and Wellington, offers both the skier and snowboarder world class skiing and snowboarding. The two commercial skifields - Whakapapa on the north west slopes and Turoa on the southern slopes of Mt Ruapehu, have the nation's most developed fields with outstanding facilities. 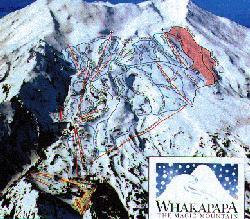 Both skifields are located near full service towns - National Park for Whakapapa skifield and Ohakune for Turoa skifield, offering a range of ski town services and facilities, regular bus and coach services from Auckland, Hamilton, Whanganui, Palmerston North and Wellington, domestic air services from Auckland and Wellington to Taupo about 2 hours drive away from the mountain. 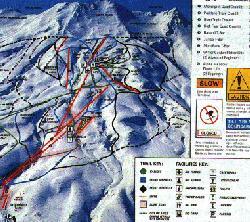 The nearest international airports to these skifields are Auckland and Wellington. Whakapapa is best known for awesome off piste skiing, while Turoa combines great skiing with a vibrant apres ski scene. Finally do not worry if you don't have time for a holiday until October as Mt Ruapehu is famous for its quality spring skiing. The Whakapapa skifield and Turoa skifield are closed for the season.